We are highlighting Boston bombing survivor Adrianne Haslet-Davis this month as our inspirational person. Once ranked 3rd in the world in Ballroom dancing Adrianne Haslet-Davis has become an inspiration of hope to many people around the world. 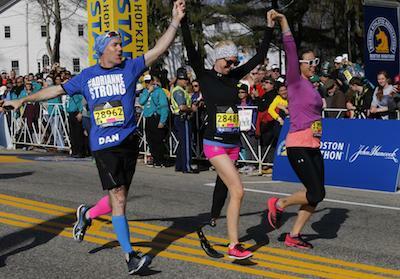 Haslet-Davis was one of the many bystanders at the Boston Marathon bombings, the April 15, 2013, terrorist attack that killed three people and injured several hundred others, including 16 who lost limbs. The attacked resulted in Haslet-Davis’s leg being amputated due to the loss of her left foot. After only being out of surgery a week, she made a promise to herself that, no matter what, she would dance again. She fulfilled that promise and has since appeared on dancing with the stars. Recently she completed the 121st Boston Marathon last year in April 2016. After spending 10 hours on the course, she became the second person who lost a limb in 2013 to complete the race on foot. Haslet-Davis ran on behalf of the non-profit Limbs for Life Foundation to raise funds for new prostheses who those who can’t afford them. Near the halfway mark Haslet had tweeted about having trouble with prosthesis and spent some time the medical tent due to unexpected leg swelling. Many people sent her words of support through social media, including President Barack Obama, and Tom Brady who called her his Inspiration. “It’s just an awesome, awesome day and I wouldn’t have missed it for the world and I had a lot of people pulling for me as every runner does.” Haslet-Davis via Boston Herald.